Here’s an interesting job I recently completed at a house near the centre of York, the biggest town in North Yorkshire and famous for its Viking history. 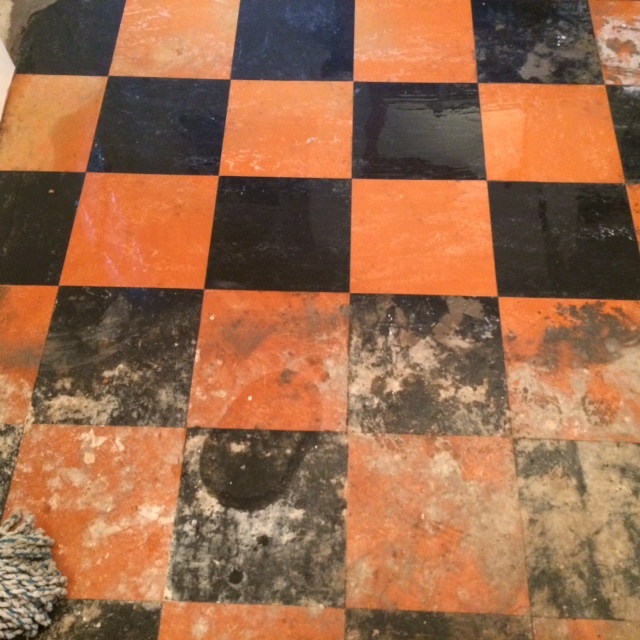 My client had initially emailed me some pictures of her tiles which, upon first inspection, looked like Black and Red Victorian tiles. This was also the opinion of my client and her friend, who is a builder. The floor had previously been covered by carpet, which was fixed down by adhesive. As such, the newly unveiled floor was in a bit of a state, with adhesive markings ruining the appearance of the tiles. I agreed a date with my client to give the tiles a closer inspection. 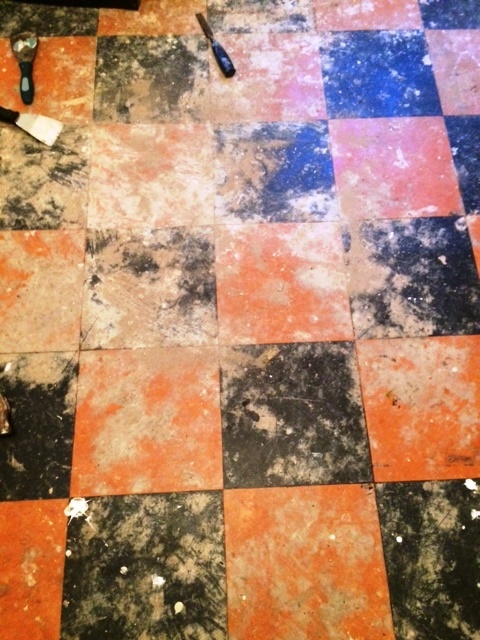 Upon my arrival at the house, I discovered that the floor was in fact made up of linoleum, rather than Victorian tiles. This was a surprise to me as Tile Doctor don’t usually get asked to work on Vinyl flooring. Nonetheless, I agreed to restore the floor to the best of my abilities. To clean the floor, I started with a blunt chisel (so not to puncture or tear the Lino) and proceeded to scrape off all the glue and plaster from the floor. Had the tiles been unpolished natural stone I would’ve used a product such as Tile Doctor Remove & Go to break down the adhesive markings. The next step was to restore the appearance of the floor using a combination of Tile Doctor Pro-Clean mixed with Grout Clean-up. The latter product contains phosphoric acid to break down any remaining cement, while the former is a versatile, high alkaline cleaner. Finally, the floor was given a thorough rinse with clean water to remove any trace of chemical and then sealed with a Linoleum sealer. 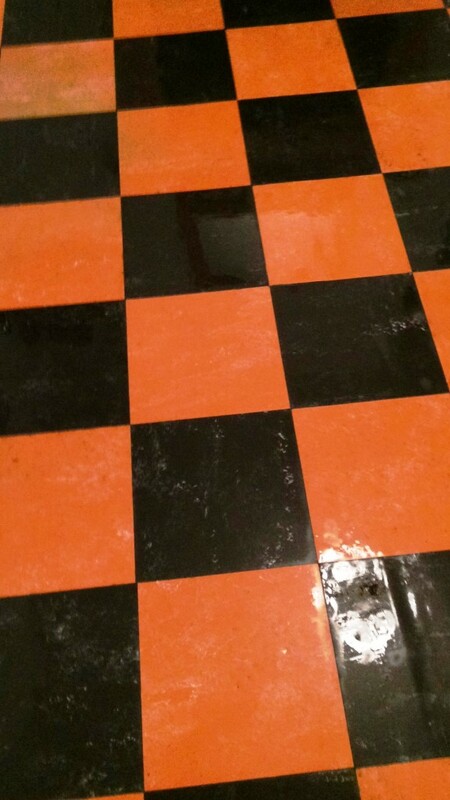 Despite not coming across this type of floor often, I am very pleased with the results I was able to achieve. Needless to say, my client was also very happy with what is essentially a fantastic new feature for her house.